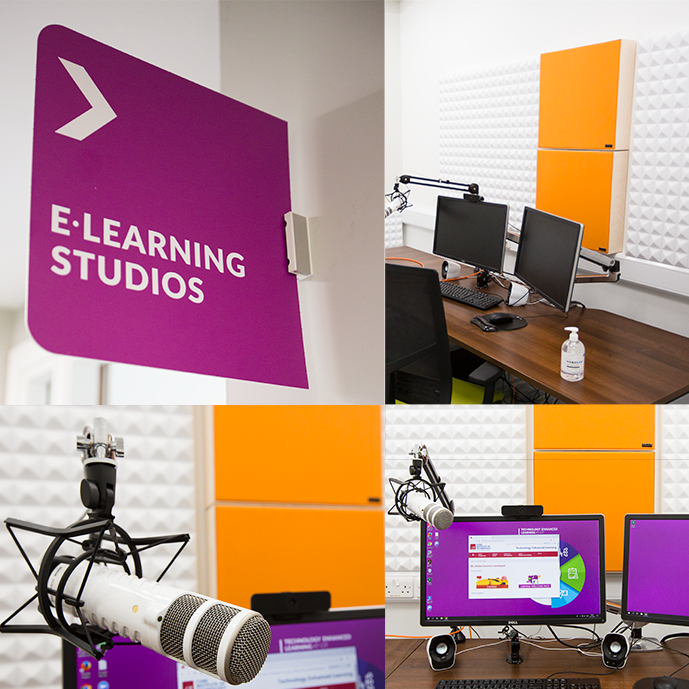 6 “e-learning studios” have been developed to offer bespoke spaces for individual lecturers to deliver live or synchronous classes. Each studio is sound proofed and provided with an optimised workstation, two large monitors, a HD webcam and a shock mounted condenser mic as well as an optional graphics tablet with an integrated LCD and pressure-sensitive control to allow, e.g., for precise live annotations and drawing over lecture/presentation content or shared screen content. The studios also allow lecturers to bring their own device, as required. The studios are primarily used in support of live distance lectures, with the lectures typically being recorded for asynchronous viewing later by the institute’s online students but the studios are also used to co-ordinate virtual labs, to produce multimedia content such as podcasts (or other quality audio content) and instructional videos. The studios can also used to conduct usability testing and user research.